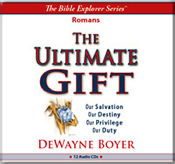 DeWayne Boyer: Explore Romans (Verse by Verse) Bible Study: . "The clearest gospel of all", Paul's epistle to the Romans is central to the message of the New Testament and to understanding the Apostle's mind. God accomplished in Christ what could not happen any other way: —a new, perfect standing with Him, peace with God, freedom from the power of sin, freedom from the law's condemnation and thinking of law as a method of salvation, and freedom from the ultimate enemy -- —death. Paul is obsessive compulsive, about Jesus. He can hardly wait to get his name out before his singular passion of the Good News of Christ breaks through. No book of the Bible has inspired more revivals or brought more people into a deep and genuine relationship with God than this book. We invite you to explore with us its key messages with a dedication to being ever faithful to the text while suggesting life applications for us today. He and his wife, Bev (also a teacher), live with thankfulness for God's amazing leading in their lives, and are now discovering the fun of being grandparents. DeWayne looks forward to getting well acquainted with the apostle Paul when they get to heaven. 1. Long Live the Gospel!